Property 13: Private, seaside cottage with stunning views. Property 17: Spectacular Woolleys Bay! 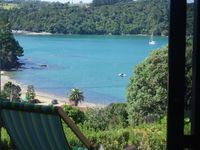 Property 24: Cedar Heights Chalet with Elevated Ocean Views in a Native bush setting. Property 36: Amazingly Waterfront - swim off your front lawn! 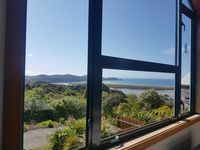 Property 37: Quintessential Kiwi Bach right on the Beach !! Property 39: Stunning Ocean Views and close to the best beaches! Property 45: The classic Kiwi Bach, love the lifestyle !